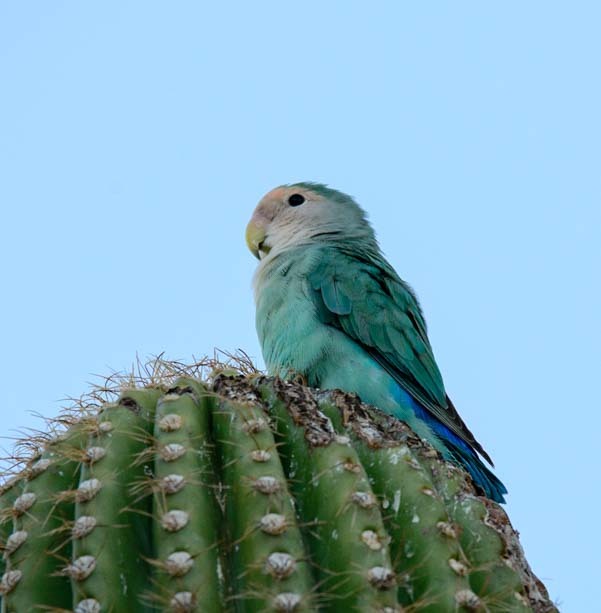 This entry was posted in Arizona and tagged Arizona, Arizona Animals, Arizona Central, Arizona Images, Arizona Phoenix East, Birds, Birds and Wildlife, New, Travel, USA by Roads Less Traveled. Bookmark the permalink. What a great camera and patience. We found where they hang out on the canal in Mesa between Broadway and Southern on the edge of a horse ranch. We could hear them as we rode our bikes. How neat. We’ll have to look for them there too. I love their little squeaks!!! That’s the hood. Lucky you!! 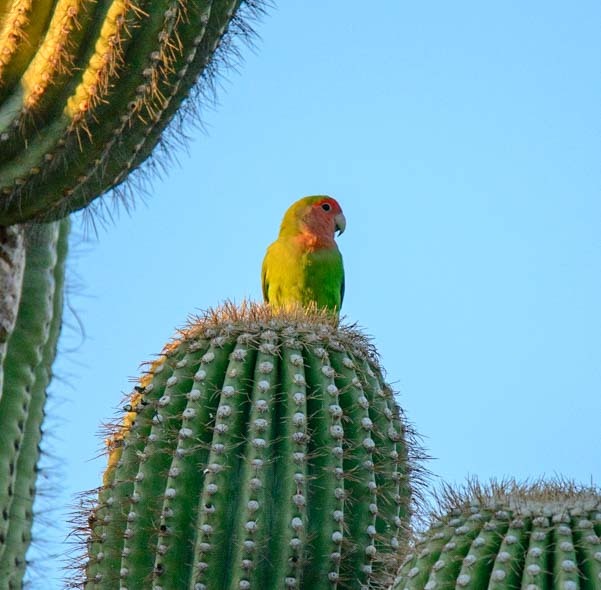 I had no idea lovebirds have “gone wild” in Arizona! Glad to know that even though they’re not natives, they’re not pesky invasives. 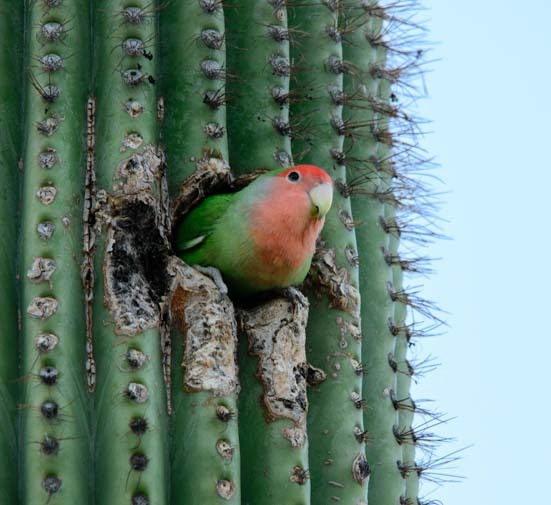 Your photos of the birds peeking out of the saguaro are absolutely adorable! They are a sweet bit of wildness in the city, and they are so cute to watch as they climb in and out of their holes…! When visiting family in Tarpon Springs, Fla., I was amazed at the large flocks of wild parakeets (budgies) roosting on telephone wires towards sunset. At times, I could count well over 100 individuals in one flock. Whether they caused agricultural/home garden concerns, I didn’t know. How fun! 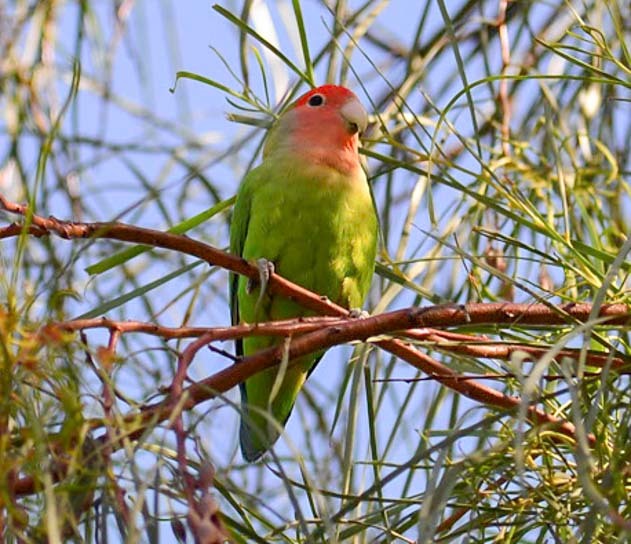 There are pockets of feral parrot flocks all over the US, and it is so neat to see them. 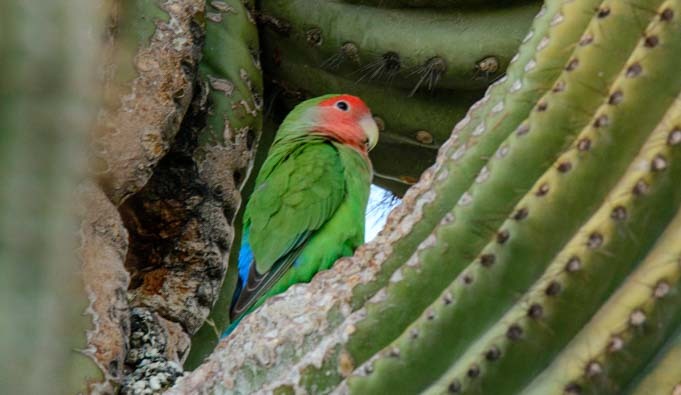 We watched a flock in a tree near a harbor in St. Petersburg, Florida (can’t remember which type), and I remember reading about a large flock of Monk Parakeets that took up residence in Chicago. Such fun little guys. I think their numbers are too few to have much of an impact on local flora and fauna. Cats keep their population from growing too fast! Great article on the lovebirds, thank you. I live in Scottsdale between Hayden Rd and the 101 on Camelback Rd, and we have had them in this area for well over 5 yrs. I have a feeder directly out my front kitchen window and enjoy watching them feed most every day. Some days, as many as 6 birds will wait patiently (sometimes not) as the 3 that will fit on the feeder take their turn. I have tried many times to take pictures but only have my phone camera, and through the window screen, just doesn’t work. They won’t let us get closer than about 100 feet. I originally put the feeder up to watch the darling little finches that flock to it. They are pretty too, with their red and sometimes yellow, heads and breasts. This is year around entertainment!! Lucky you, Ginna. How fun to have so many at your feeder and to be able to watch their crazy antics all year long! 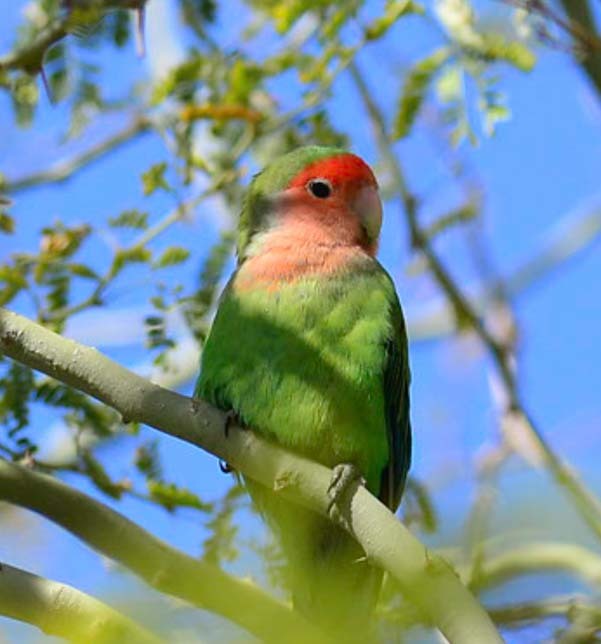 Hello, I live in Sahuatria Az and just now had about 8 love birds at my feeders. I hope they stick around. Lucky you! That’s quite a flock. Enjoy them — I hope they stick around for you! Just an update about the love birds. I am so sorry to say one of them was caught and killed by a roadrunner, (I have yet to forgive him). We only have 3 that are still hanging around. We put up a bird house by our bird feeder in one of out mesquite tree’s hoping that they will nest in it. Would you recommend any sort of food/fruit to “bribe” them into living in the bird house, or any other possible suggestions on a location to put the bird house where they would feel more comfortable? Too bad about that roadrunner, but they do eat other birds. I watched one kill a mourning dove once, and it was quite a gruesome sight. I don’t blame them, though, that’s just what they like to eat, but I was very surprised to watch the roadrunner tackle that dove because they aren’t all that different in size! As for bribing them to come back, I’m not sure what kinds of treats would tempt them. Maybe try a variety of things like fruits (apple, cherry, orange, banana) and various seeds. They might like hot peppers or red/green peppers (the seeds especially, so leave those on!). If you’re using regular backyard bird seed, perhaps stop by a pet store and pick up some parrot seed. There is a lot more safflower seed in parrot mixes than in backyard mixes and a lot less sunflower seed too, and the seeds may be fresher. Also, birds like to be higher up so they can have a “bird’s eye view” and “rule the roost.” So maybe try hanging the feeder in a spot that feels like the “highest” thing around, either the top of the pole it’s hanging from or from the highest strong branch in a tree (in a low enough tree so you can still enjoy watching them). Good luck. I hope they return! I’m staying temporarily at my brother’s house in Mesa, near Power and Brown. A couple weeks ago, they said they saw a green parrot-like bird. Yesterday I saw one in the tree. Today it was hanging on the “sock” finch feeder. And then a second one came along. I was amazed! They are beautiful birds. They are very beautiful birds and they are little comedians too. Enjoy!! Yeah the love bird is very playful parrot. They’re funny as pets. Some will be your best friends but be careful during breeding season. They can be very territorial, and the blue gene mutation comes from the velvet specie. These birds are a mix breed 1-3 different colored specie. It would be nice to see a wild flock of lovebirds. 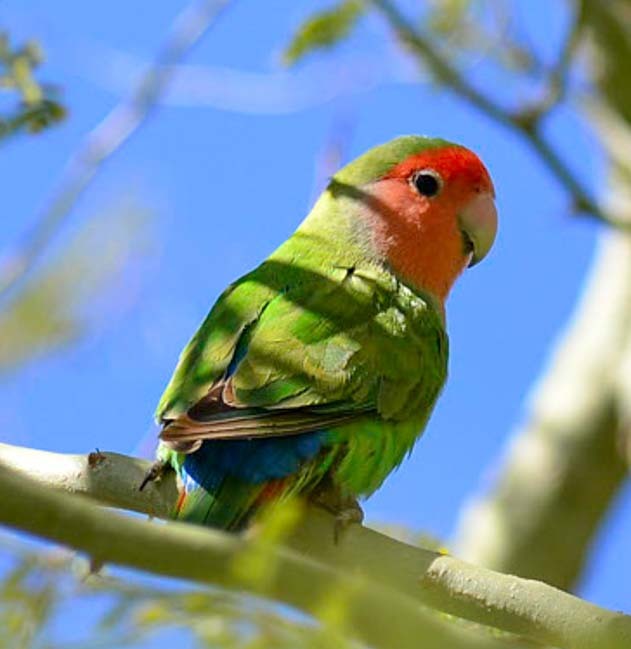 It’s surprising there appears to be no wild lovebirds in the desert areas of CA near San Diego and Los Angeles because there are plenty of lovebird breeders within this region. I’m sure plenty of lovebirds escaped as a result. I have a Cinnamon Pied lovebird as a pet and she is adorable and loves to snuggle and be held. She tends to have a habit of not wanting to go back in her cage once she’s on me and will grab whatever part of my hand when I place her in the cage. I moved to Arizona in February and brought a bird feeder with me from Washington. I put it out with some specialty birdseed and the love birds flocked to it. I currently have four feeders out there now and attract about thirty of them each morning (in addition to many other small amd large birds). They are so entertaining and such beautiful birds We are located between 32nd and 36th Street just off Shea. How fun!!! Lucky you to see these beautiful little birds playing at your feeder every day!! 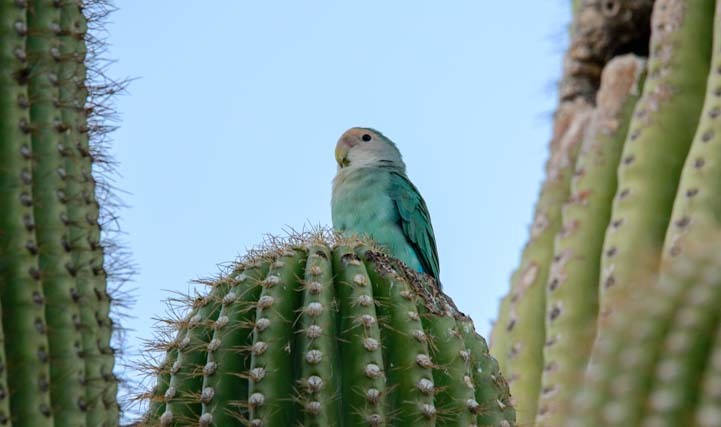 There are about six of them in the Saguaro across the street from us. You can see there heads poking out looking to see when I head to the feeder. They will literally sit on the window sill and peck the window if I take to long to feed them. How fun! Those little guys are super smart, so I’m not surprised they keep an eye on everything you do around that feeder!! We are birders from Dallas, where we enjoy seeing the huge nests of naturalized monk parakeets in the Dallas suburbs. 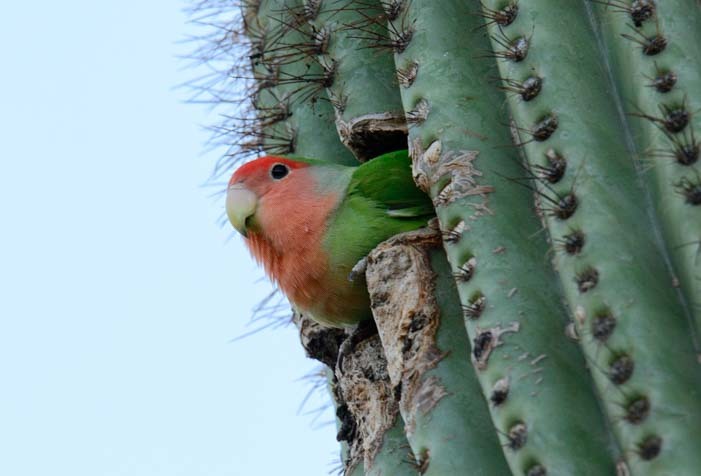 Today we came to visit the Fairmont Scottsdale Princess Resort in Arizona and were surprised to see these cute little rosy-faced lovebirds. I saw a flock of 12 drinking from a little puddle at the resort. 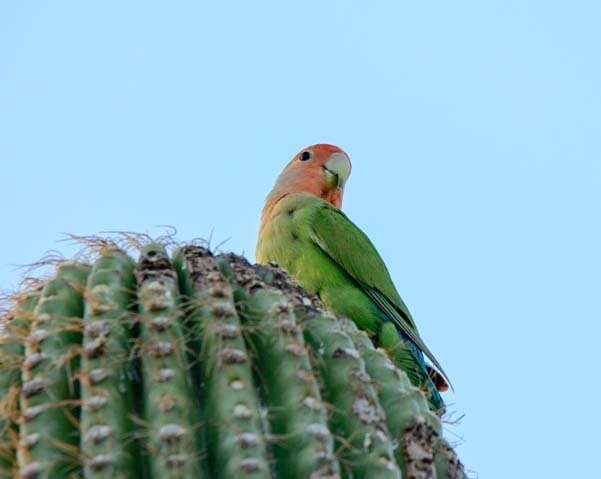 We have also seen big flocks of red-crowned parrots during the Rio Grande Valley Birding Festival in Harlingen, Texas. Parrots of any kind are always beautiful and exciting to see. How cool is that?! I remember reading about a big colony of monk parakeets in the Chicago back in the 80’s. How cool that they are in the Dallas suburbs too. I had no idea red-crowned parrots could be seen in large numbers in Texas too. That is awesome!! I feed a flock of about 20 peach-faced lovebirds every day. There are also two blue mutations who have white faces and blue bodies, and one who is almost entirely bright yellow. As for ‘what to feed them”, I have tried many things including very expensive parrot food, peanuts, wild bird seed, and black oil sunflower seeds. Their favorite, by far , is the sunflower seeds. Just bought three 10 lb bags for $5 each at Ace. They go through two feeders full each day. I had one wonderful bird feeder that held many birds together, but it was big enough for the pigeons which I did not want to encourage. I now have a cylindrical nut feeder which can hold sunflower seeds and has no place for pigeons to hold on. Also have a simple cylindrical feeder with 6 smallish roosts that will accommodate the lovebirds and porch finches. My flock of 20+ is at Camelback and Hayden in Scottsdale. Wow!! How amazing and fun to have two blue mutations and one all yellow mutation in with the rest of your flock. I’m glad you have been able to find an affordable feed for them and that you have a feeder that will accommodate them without encouraging the pigeons. Enjoy your flock. We’ll have to swing over to that area and see if we can see any flying around. We saw a bunch near 52nd and Cactus the other day.